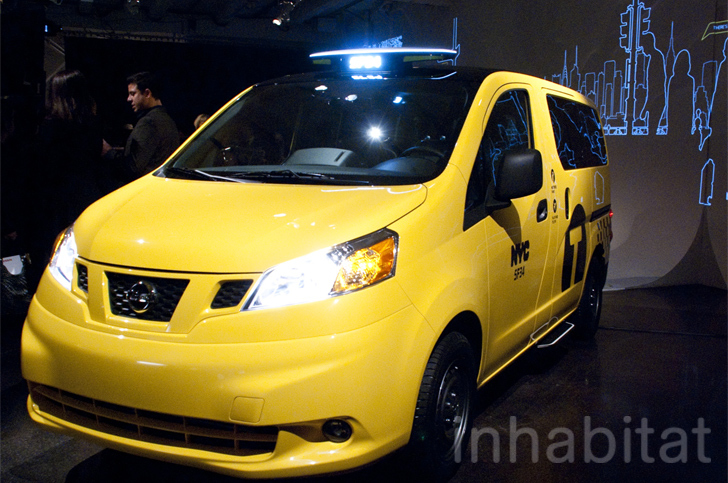 The NV200 Taxi is the first full vehicle prototype of the Taxi of Tomorrow, and Inhabitat was on the scene as it was unveiled at a special event last evening at the 2012 New York Auto Show. After a two-year competitive bid selection process, the New York City Taxi and Limousine Commission (TLC) selected the Nissan NV200 Taxi in May 2011 as the exclusive taxi of New York City beginning in late 2013. Which design do like better? 52 Votes They both rock - I can't decide! The Nissan NV200 Taxi has room for up to four passengers and their luggage. Its sliding doors make getting in and out of the taxi much easier than most of New York’s current taxis, and it also has a transparent roof, giving passengers a unique view of the city. An active carbon-lined headliner helps neutralize interior odors, and breathable, antimicrobial seat fabric simulates the look and feel of leather. The Nissan NV200 Taxi is powered by a fuel-efficient 2.0L four-cylinder engine and Nissan also gave the taxi a new “low-annoyance” horn with exterior lights that indicate when the vehicle is honking, so the horn is used less frequently. The passenger area also has air-conditioning controls and a mobile charging station for passengers, including a 12-volt electrical outlet and two USB ports. Responding to complaints that the new taxis are not wheelchair-accessible, Nissan announced that they are working with Braun Corp. to develop a creative solution to this problem. The mobility option will be available to taxi drivers when the vehicles are released in 2013. Nissan is also working on a small pilot program to study the use of all electric vehicles as taxis. Nissan will provide six Nissan Leafs and three Level 2 charging stations at no charge to taxi owners participating in the program to test the electrification of the taxi fleet. “The Nissan NV200 unveiled today will be the safest, most comfortable and most convenient taxi the City has ever had,” said New York City Mayor Michael Bloomberg. “New York City cabs have always been iconic, and now they will set a new standard.” The new cars will be produces in North America at Nissan’s manufacturing facility in Cuernavaca, Mexico, and they will cost approximately $29,700. @Jeanwheels: Don't you know that people of tomorrow don't need wheelchairs..?? ..And oil is cheap and in abundance. Our nation's capitol has a Martin Luther King Jr. statue sculpted by Chinese sculptors because they were cheaper. Now our biggest metro area is using taxis not made in our own country, after we went to the expense to bail out our auto industry. Creating an economy that doesn't support the middle class is another type of pollution. The taxis will maintain their lights on top to indicate whether they are available. The taxis will also keep their signature yellow color. The official unveiling happened yesterday and drew lots of press. Drivers controls are pictured above. Its sliding doors make getting in and out of the taxi much easier than most of New York’s current taxis. The Nissan NV200 Taxi has room for up to four passengers and their luggage. The passenger area also has air-conditioning controls and a mobile charging station for passengers, including a 12-volt electrical outlet and two USB ports. Nissan also gave the taxi a new “low-annoyance” horn with exterior lights that indicate when the vehicle is honking, so the horn is used less frequently. Signs on the outside of the cab clearly indicate what riders can expect in terms of cab fares. Pictured above is the Taxi of Tomorrow. The front doors open out and the back doors slide open. "We're proud to introduce a new era of urban mobility to New York with the Nissan NV200 Taxi - New York City's Taxi of Tomorrow," Nissan President and CEO Carlos Ghosn said. "The exclusive Taxi of Tomorrow draws on Nissan's global experience in commercial vehicles, as well as insight from New York City taxi drivers and passengers, who helped identify important improvements over today's cabs. The Nissan taxi will deliver unprecedented levels of innovation and comfort to New York's 600,000 daily taxi riders." The Nissan NV200 Taxi is powered by a fuel-efficient 2.0L four-cylinder engine and Nissan also gave the taxi a new "low-annoyance" horn with exterior lights that indicate when the vehicle is honking, so the horn is used less frequently. The Taxi of Tomorrow also has a transparent roof, giving passengers a unique view of the city. An active carbon-lined headliner helps neutralize interior odors, and breathable, antimicrobial seat fabric simulates the look and feel of leather. The passenger area also has air-conditioning controls and a mobile charging station for passengers, including a 12-volt electrical outlet and two USB ports. Responding to complaints that the new taxis are not wheelchair-accessible, Nissan announced that they are working with Braun Corp. to develop a creative solution to this problem. The mobility option will be available to taxi drivers when the vehicles are released in 2013. Nissan is also working on a small pilot program to study the use of all electric vehicles as taxis. Nissan will provide six Nissan Leafs and three Level 2 charging stations at no charge to taxi owners participating in the program to test the electrification of the taxi fleet. "The Nissan NV200 unveiled today will be the safest, most comfortable and most convenient taxi the City has ever had," said New York City Mayor Michael Bloomberg. "New York City cabs have always been iconic, and now they will set a new standard." The new cars will be produces in North America at Nissan's manufacturing facility in Cuernavaca, Mexico, and they will cost approximately $29,700.